← News Quiz, 1947: How Many Stories of the Year Do You Know? Note: This is an encore post from 2017. Joe Vogel asks if there was a Queens Cocktail. The answer is yes. 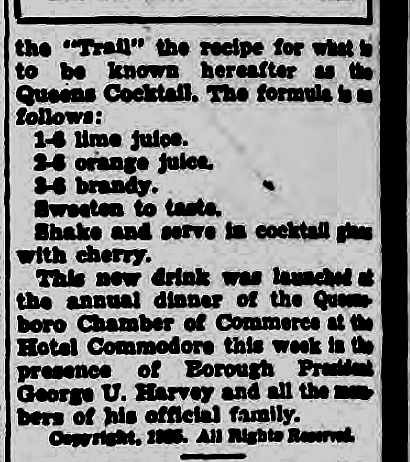 According to the Jamaica Long Island Daily Press, Jan. 24, 1935, the Queens Cocktail debuted at the Hotel Commodore in a toast to President Roosevelt. Via Fultonhistory.com. (No word yet on the Staten Island Cocktail — and boy that sounds like a straight line). And here is the recipe, from “The Wine Trail” by G. Selmer Fougner, the Jamaica Long Island Daily Press, Feb. 2 or 3, 1935, via Fultonhistory.com. And yes, it’s a little hard to read. I actually cleaned it up a bit. Meanwhile, we have this recipe for a Queens Cocktail from Winnie O’Conner. From the Long Island Daily Press, Feb. 2, 1937, via Fulton History.com. 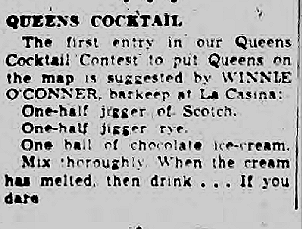 This entry was posted in 1935, 1937, Food and Drink and tagged 1935, 1937, food and drink, Queens Cocktail. Bookmark the permalink.